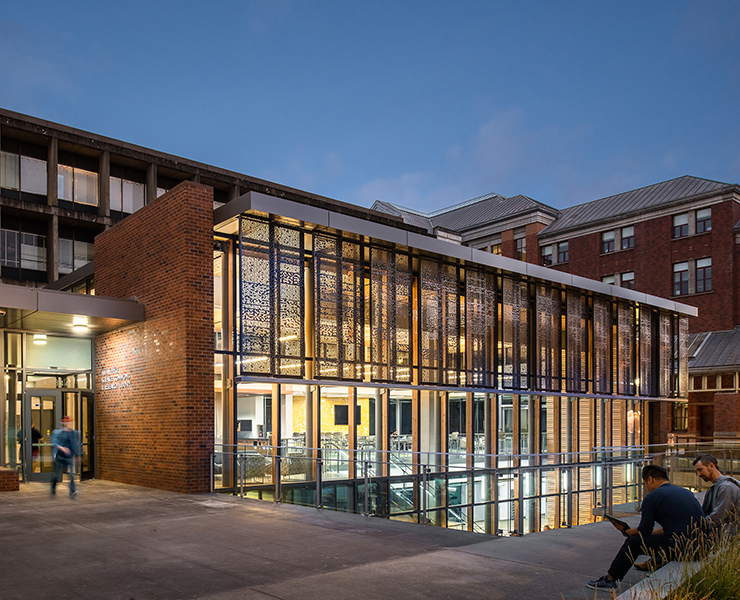 The University of Oregon Price Science Commons and Research Library has been recognized with a 2017 AIA Education Facility Design Award. This 41,000 sf facility creates an inviting identity for the Lokey Science Complex as a glass-enclosed pavilion containing a social commons café and event space, overlooking and connecting to the subterranean research library and landscaped courtyard. A hub of student activity, it is a technologically robust, dynamic environment for learning and discovery that reflects a modern-day paradigm. The student-centered design promotes experimentation, collaboration, and investigation. Spatial flexibility, with classrooms that reconfigure into study groups and informal learning arrangements, promotes collaboration across diverse user groups. Science-specific study rooms support collaboration, tutoring, and hands-on learning. “The Price Science Commons rethinks the library to advance its evolution into a place of discourse and invention imbued with nature,” said Opsis Principal and Designer Jim Kalvelage. This is such a beautiful and inviting project. The insertion of this relatively small building has transformed a rather undesirable void into an oasis of community and study.